A classic combination goes Salt & Sugar Free! The blending of lemon with cracked black pepper has always had a tremendous following. Now, all of its wonderful tart and pungent flavor is released when used as a cooking ingredient or versatile “sprinkle on” seasoning. This popular blend will become your tabletop favorite! No Preservatives MSG-Free and Gluten-Free Sugar Free and Salt Free Kosher and Halal approved NO SALT SUBSTITUTES! Only 10 mg of natural potassium per serving. 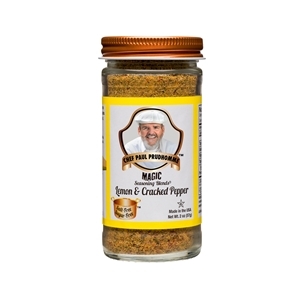 Ingredient: Black pepper, onion, garlic, natural lemon flavors, red bell pepper, spices, carrot granules, parsley flakes, maltodextrin, citric acid, stevia extract.